Who met Osaafo-Maafo, JAK & Chinese Ambassador? Who was to benefit from the $12 million fees? Did JAK take a week's break from this Scandal? “I don't know where the people went and dreamed up the phone number of the address they were using. You see you have to use the facts on the Memorandum of Understanding.” These were the words of the beleaguered finance minister Yaw Osafo Maafo at a press conference last week where he failed to address any of the questions raised by journalists about the CNTCI loan scandal and rather chose to attack the integrity of journalists. The Finance Minister's attempt to defend what can become a highly embarrassing scandal has not won favour with majority of Ghanaians. At the press conference, Mr. Osafo Maafo beat a speedy retreat when it became evident that the poor job of what they called a 'due diligence' was so obvious that it was virtually inexplicable. With each day more revelations by JoyFM and other media indicated that not only was a poor job done but that even the most amateur investigation would have revealed the contradictions in the CNTCI MOU. The Government of Ghana signed an MOU with CNTCI that claims to be based in the United Kingdom. In the MOU CNTCI claimed to be domiciled at 150 Hammersmith road London UK. Both the postcode and the address are false.150 Hammersmith road is the place of business of Wish Hairdressers. JoyFM correspondent Jake Addison visited the location and spoke to the occupants who have been there for years. The shop itself is best described as a kiosk/ shop. The government has attempted to explain the contradiction by arguing that 150 HAMMERSMITH ROAD was the “former operations office” of CNTCI. The proprietor of Wish Hairdressers has denied this assertion. There is no other office space at 150 Hammersmith Road. In fact Wish Hairdressers have indicated that they will take legal action against what appears to be the use of their address under false pretenses. The Crusading Guide newspapers after speaking to an unnamed CNTCI official suggested in their Tuesday May 18, 2004 edition that they have another address in the UK. The minister has given no explanation for the wrong postcode given in the MOU either. CNTCI gave their postcode as W6 7JZ England, which happens to be the postcode for another location 238 A Latymer Road! But it gets even murkier. JoyFM employed the services of a leading UK audit firm who have made available details of the so-called CNTCI's company registration forms. 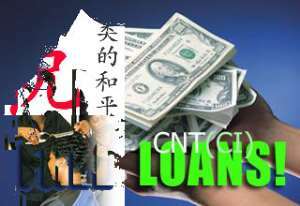 The company was formed under the name CNT Construction Investment. However on their registration form their address is nowhere near Hammersmith either. CNT construction investment Limited Room 2A second floor China supermarket 32-34 Tudor Street Riverside Cardiff CF116AH On the same form under the section Nature of Business there is a simple statement, “None supplied.” Again no explanation is forthcoming about these bizarre changes in address from the companies registration form to the memorandum of understanding with the government of Ghana. Additionally in the MOU, CNTCI gave their phone number as 00448701362693 (a UK number) and the fax number as 309 409 6863 (a US fax number). Even stranger is the fact that the (309) area code is for Peoria Illinois in the USA. Further checks indicate that there is no office of CNTCI in the USA. Recently the argument was made that the numbers were “connected to their internet for security reasons.” An Internet expert JoyFM spoke to described that statement as “mind boggling”. It is known however that some companies use what is called e-fax but not for any security reasons. CNTCI has neither a website nor an email address. The promoters of this deal are also unknown. Who met with the finance minister and the Chinese Ambassador who is linked to this deal and met with the President? Who represents CNTCI in Ghana and who benefits from the approximately $12 million in management and other fees? It gets more confusing as you flip through the documents. In what was presented to the parliamentary finance committee as a due diligence report, but appears to be a company profile of a sort, one of the shareholders of CNTCI's exclusive shareholder structure is Columbus Newport Limited (a so-called public affairs lobby in the United States reported to consist of one David Wilmer a “secretary to 5 former US presidents”). JoyFM's contacts in Washington DC are yet to confirm the existence of any such lobby group but our enquiries have not brought up the name of any such individual or such a job description as having ever worked in the White House with any, let alone with five (5) US Presidents. Other shareholders include a Universal Credit Bank and Trust Company of Granada, which claim to have a net worth of several billions, China Rail and Alberni United. Note that again this is contrary to their UK registration forms that show only two (2) shareholders (R.M. Edwards and H.N Fernando). The purported due diligence report leaves a trail that leads to banks in Granada and an offshore investment company called Alberni United SA whose locations are not given .The president of Alberni United SA is one Mr. Edwards. Possibly the same R. N. Edwards stated on CNTCI's UK registration form. As the details become more confusing government spin-doctors are trying to find every plausible argument for these contradictions with contradictory and vacuous explanations. At present both the Information and Finance ministries are keeping silent and according to the Minister of finance are “receiving more information from CNTCI” and will have an explanation “at the right time.” When the “right time” will be is not known. However most observers agree that the government (and indeed parliament who missed all these blatant contradictions as well) has lost a lot of credibility from this debacle. JoyFM investigations continue with the hiring of financial analysts to examine the credibility of a 300 million dollar loan at an interest rate of 0.65 percent over 30 years. “Too good to be true” was the response of a managing director of one of the world's leading investment banks based in Europe. Speaking under condition of anonymity he said that even the United States, considered the most risk free nation, borrows at a rate based on LIBOR (London Inter bank Borrowing Rate) or the 30 year US bond rate both of which were far above 0.65%. Regardless of these questions, sources close to the government seem to suggest that the leadership is bent on pursuing this loan at all costs. Government spin-doctors are struggling and glossing over the bizarre details and blatant contradictions with very weak explanations. JoyFM's next stop is Hong Kong. Meanwhile government's credibility is hemorrhaging badly with each day of silence. A silence possibly motivated by the fact that there are no logical answers for this mess! In the meantime President Kufour began a one-week leave on Monday.